Many journalists have become involved in motor racing and driven racing cars but most of them raced in sports, GT or Touring cars. None, however, can claim the kind of successes achieved by Belgian motoring journalist Paul Frere. Consider this. 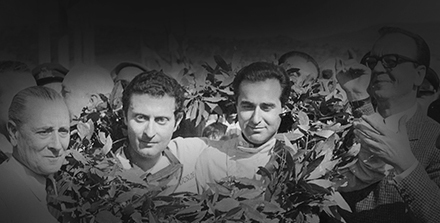 He raced at every level of the sport, and not only won Le Mans for Ferrari but was a successful grand prix driver and was a staunch member of the Grand Prix Drivers Club. He raced in eleven grand prix, for HWM (4), Gordini (4), and Ferrari (3) and racked up a total of 11 world championship points. When you then consider that he retired all four times with Gordini and twice with HWM, his points score is pretty impressive and included a second place at his home grand prix at Spa in Belgium in 1956 driving a Lancia-Ferrari D50. It will be ten years in February since Paul died in Monaco, where he lived for many years, and even into his eighties he enjoyed attending race meetings and occasionally testing a racing car for old time’s sake. He had a technical mind and was one of the few journalists who could actually describe in technical as well as layman’s terms, what it is like to race at the highest levels of the sport. What is more, he was modest about his successes, polite and punctual. His mother’s family founded a company that produced glasshouse grapes in one of the suburbs of Brussels. It proved to be a profitable business with most of the grapes going to London but then aeroplanes began to deliver grapes all over the World and the business prospered. It was his uncle who took nine-year-old Paul to the Spa 24 Hour race in 1926 – his first introduction to motor racing. Paul’s father bought his first car, a Fiat 501, in 1922 but was not terribly interested in cars. He did, however, take out a subscription to the French magazine La Vie Automobile and it was Paul who absorbed every word. Those early magazines still formed part of his immense collection of books and memorabilia. After the first world war, his father worked on various committees dealing with war reparations and later became a well known and respected economist, ending his career as the Governor of the Bank of Belgium. Paul Frere studied engineering and during the second world war, he began writing technical articles to try to build a reputation with a view of getting a job in the motor industry. He succeeded in becoming service manager for the Belgian importer of the American Kaiser-Frazer cars followed by a year in the press department at General Motors in Antwerp. He then became service manager for the Jaguar importer in Brussels. Paul was not to know at the time that his overall boss, Lofty England, was later to choose him to race in the factory Jaguar team. One day in 1948, Frere was riding his motorcycle through Brussels when he met up with Jacques Swaters driving an old PB MG that he had only just bought. The MG had been owned by Claude Bonneau and had raced at Le Mans in 1938. Bonneau crashed the car badly prior to Le Mans and rebuilt it with a new chassis from MG and a light aluminium racing body. In 1949 a race was announced at Spa for strictly standard touring cars. Then in 1950 a class was created for cars classified by their list price in Belgium. In the lowest class there appeared nothing to beat the Dyna-Panhard. Frere went to see the manager of the company importing the car into Belgium and showed him the regulations adding that he felt the Dyna-Panhard could win. The manager agreed to enter a car and Paul went out and won the race. There followed an extraordinary turn of events. The noble Baron still drove the Jaguar in the race retiring, as soon as it started to rain, but Frere had managed to prove a point, with his three practice laps. For the 1952 Spa touring car race, the organisers decided the cars had to be absolutely standard and the car which raced had to be taken from ten identical cars off the showroom floor. An independent adjudicator would then point to two of them, and those were the cars that could be raced. In this way, the organisers received entries from the American big three: General Motors, Ford and Chrysler. The GM cars were Oldsmobile 88s and the general manager of their team was a former racing driver Andre Pisart, who had been a factory driver for Chenard-Walcker. Pisart chose as drivers of his four Oldsmobiles Johnny Claes; Jacques Swaters – who had by now been racing a Ferrari – and Andre Pilette but had not decided on his fourth driver. Luckily for him, Paul was very friendly with the HWM team led by John Heath. A few years earlier, when George Abecassis, John Heath’s partner in the business, entered his Alta for the Grand Prix of Paris, he broke a timing chain in practice. As the replacement had to be non-metric, Paul Frere offered to find one for him. He set off on his motorcycle to tour every car breaker’s yard in Paris until he found a replacement and rushed back to the circuit. He also knew the way HWM operated. 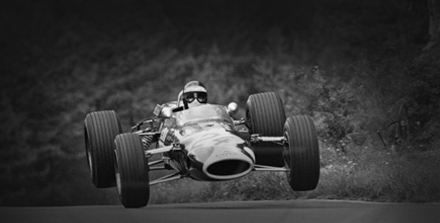 They often employed local drivers in grand prix events because it brought them better starting money. Frere wrote a letter to HWM and received a very polite reply to say they could not provide a car, as the team was already complete. Once more chance and luck played a part. Prior to the Belgian Grand Prix John Heath had entered three HWMs for a race at Chimay. Peter Collins was one of the drivers for this race but as he was a contracted driver with Aston Martin, he was sent to the Monaco Sports Car Grand prix that took place on the same day. So, on the day before practice for the Chimay race, Frere received a telephone call from John Heath. “ He rang me and said he could not provide a good car for me in the Belgian Grand Prix, but if I cared to come at 7o’clock the next morning to Chimay I could drive the Collins HWM. Of course, I went, and after three laps of practice, I spun and slightly damaged the tail of the car. John was not very happy and I think he delayed the repair of my car as long as he could. Meanwhile, the track had dried more and more, so when I went out near the end of the practice session, I made pole position. John Heath was over the moon with the win by his new driver and immediately promised Paul a car for the Belgian Grand Prix. Frere took 5th place in the race right behind Mike Hawthorn’s Cooper-Bristol and his International racing career was on its way. He was to continue driving for HWM. One of his favourite races was the Eifelrennen at the Nurburgring in 1953. It poured with rain and Frere had as his team-mates Lance Macklin and Peter Collins. At the start, Baron de Graffenreid in his Maserati A6GCM (c/n 2038), got away cleanly but Kurt Adolff in Rudi Fischer’s Ferrari 500 had a flier and elbowed out the HWMs and Stirling Moss in the Cooper-Alta. By the time Collins and Frere got past the Ferrari, de Graffenreid had a 15 second lead. There followed a tremendous duel between the two HWM drivers, Collins and Frere. Frere got ahead and went after de Graffenreid, whilst Collins spun when his fire extinguisher fell off and jammed under the brake pedal! In the end, Frere closed to within 2 seconds of de Graffenreid in the Maserati, and took a convincing second place. Amongst the spectators at that race, was Huschke von Hanstein, the Porsche team manager who offered Frere a seat in a factory Porsche at Le Mans that year. The car was one of the 550 coupes and Frere was partnered by another journalist, Richard von Frankenberg. They finished 15th overall winning the 1100 – 1500cc Class and were obviously the highest placed Porsche in the race. 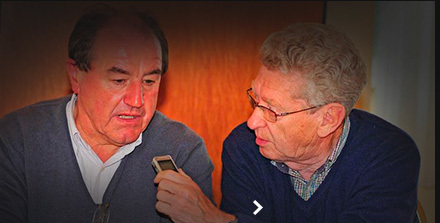 “ I remember back in 1950 Jacques Ickx took a Ford Fairlane with overdrive to Turin . He met up with Jano at Lancia. Jano studied that overdrive unit and had never heard of It before. 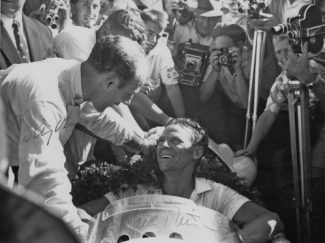 That race was to be Frere’s last world championship grand prix but in order to experience the then-modern rear-engined cars, he raced a Cooper a few times and won a non-Championship race in South Africa with one. From then on, he concentrated on sports cars, in which he was superb in long distance events. As he admitted, he never completed a full season with any team, so didn’t have as much concentrated practice as most of his teammates. He could not afford the time to race every weekend.and also preferred long distance events where you were in the car for much longer than in a grand prix. I finally asked Paul Frere about his most memorable race and he came up with three: the battle at Nurburgring with Peter Collins; the Belgian Grand Prix when he finished second; and of course winning Le Mans with Olivier Gendebien who, like Frere, was also the archetypal long-distance sports car driver. Was he not? As mentioned earlier Paul was valued within the motor industry as a test driver even into his eighties. I asked him what he thought of the changes that have taken place up to the 1990’s since the days he was racing.“ It is simply the grip and the brakes and the brakes have a lot to do with the grip. Right to the end Paul Frere was as nimble, and quick-witted as ever. His politeness and charm reminded me of some of the manners and attitudes of the racing drivers of the past, which many present day drivers could do well to adopt.